For a while during the mid- 80s and early- 90s I owned a black Ibanez Roadstar II. This guitar looked just like a Fender Stratocaster but had black pickups and a black pickguard. Aside from the maple neck, headstock and fingerboard, the entire instrument was jet black. Desperately in need of cash around 1993, I sold it to my local Wurlitzer music shop along with my little Crate amp and a rack full of Boss effects pedals (all in pristine condition) for little more than $400. It was all very nice equipment, but by no means do I regret giving any of it up. The guitars I have now are far superior and I have far more versatile effects capabilities in my Boss GT-5 guitar effects processor. Around the time I got my Gold Top Les Paul, I also picked up a used Rockman X100 so I could play around with getting that awesome Tom Scholz Boston tone. A couple of years later I nabbed another one through eBay as a back-up (plus the first one I bought didn't come with the AC adapter, which I really wanted). Click on the image of the front panel to get a better view of it. In another fit of vintage mania, I picked up a mint MXR Distortion + pedal made in the early 70s. As you can see from the picture it is the "block logo" version. I also got a vintage ProCo Rat off of eBay. It has a hard-edged distortion effect which sounds great for grunge and metal. In order to assist in learning to play with proper rhythm, I bought a Zoom RhythmTrak RT-123 drum machine. Ever since I was about 16 years old I dreamed of owning a Gibson Les Paul Gold Top guitar. I mean, I really lusted after it. I also wanted, at various times, a black Les Paul, an SG, and a Fender Stratocaster. Alas, I have never been a Telecaster or archtop fan. It took another 16 years to happen, but finally, in the spring of 1997, I got around to buying my Gold Top. At about the same time I also bought a little Crate GX-15 practice amp (pictured below), an Audio-Technica DR-3100 wireless system, and a Boss ME-8 multiple effects processor. To the left is a picture of the headstock of my 1996 Gibson Les Paul Gold Top. It is a "Limited Edition" model that Gibson manufactured specifically for Guitar Center. 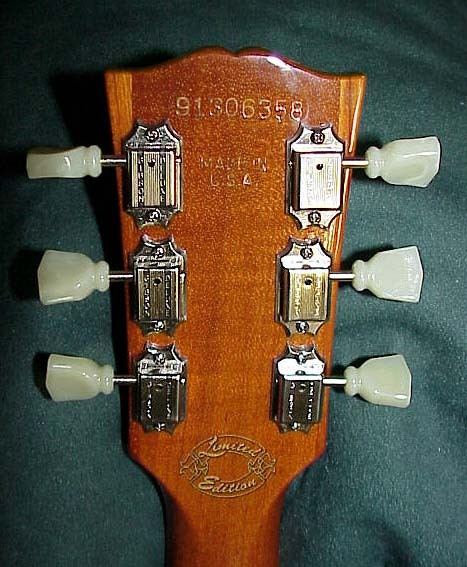 Notice the Gibson Deluxe tuners and pearloid pegs; unusual features for a Standard Les Paul (yes, the trussrod cover does have the normal "Standard" logo stamped on it). You can click on the image for a closer look at the back of the headstock if you're at all curious. In the years that followed I managed to acquire my Stratocaster and my black Les Paul, as well as an Ace Frehley signature Les Paul which I have since traded in for another Standard (the Light Burst flametop). One of these days I will also have my SG, I swear! For a complete run-down on my guitar collection, check out the gallery below. If you have the bucks and are only into the very finest guitars, check out Paul Reed Smith guitars. And for a great place to buy guitars and gear online, check out my favorite site: Musicians Friend. And if you are a Les Paul freak like me, or you love Gibson electric guitars in general and you live in San Diego, check out Centre City Music for the best prices you will find anywhere. 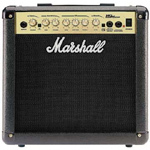 My current amp is a Marshall JCM 2000 series DSL100 all-tube head with a 1960A (slanted) 4x12 cabinet. This half-stack was acquired in May 2008 off of eBay for the princely sum of $1100. It didn't come with its footswitch, which is just fine with me since Marshall footswitches are notoriously unreliable. 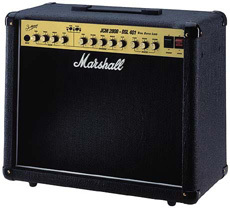 My backup amp is a Marshall JCM 2000 series DSL401 all-tube combo. 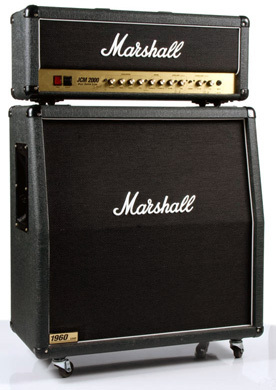 It's 40W of pure, unadulterated Marshall tone. It sports four EL84 power tubes driving a single 12" speaker. While this gives it a bit less oomph than its big brothers (the DSL100 and DSL50 heads), it can still produce that classic, roaring Marshall tone to ear-splitting levels. I may even get a 1x12 extension cabinet someday so that it can effectively function as a 2x12 mini-stack. Of course, this is somewhat unlikely now that I have a real half-stack. The blue unit above is a Boss GT-5 Guitar Multi-effects processor that I picked up "used" (i.e., in the box, in brand-new, unused condition) from a doctor in Atlanta who didn't have the time to learn how to use it. I use it now instead of the ME-8 that I bought years before. Next to it is a Boss TU-2 Chromatic Tuner that is used to tune a guitar on stage. The GT-5 has a built-in tuner, but I like the TU-2 better. Above is a little 15-watt practice amp I got for use in my apartment. It is also a lot more portable than the others. It sports reverb and an input for plugging in a CD player for playing along with songs.